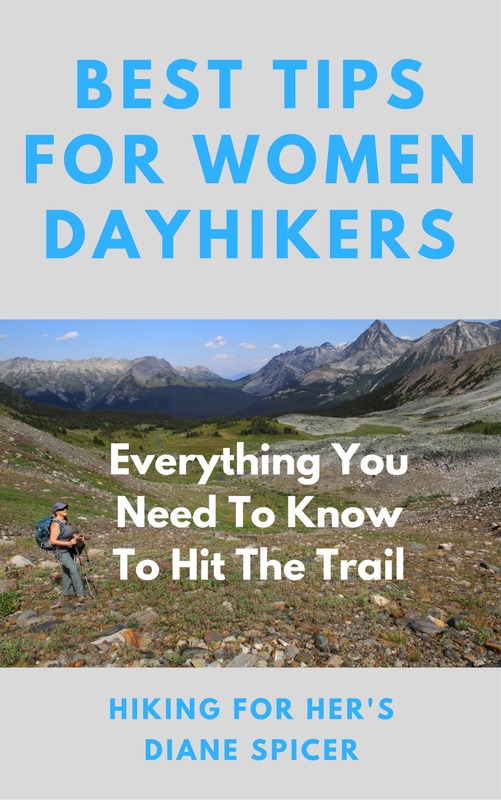 Have you been looking for a dayhiking tips book geared toward women hikers? Best Tips For Women Dayhikers: Everything You Need To Know To Hit The Trail. Click on the book cover below for a free preview. It's waiting for you on Amazon. You can see all of the details for the electronic version here. Prefer a "real" book? Here are the paperback details. Each of the ten chapters give you easy to follow specific advice to apply before, during and after your dayhike. As a veteran of 50 years of trail time, I've anticipated your hiking questions. A quick peek at the Table of Contents will show you the topics covered in this dayhiking tips book. Ten chapters of tips geared (small hiking pun) toward day hikers have been gathered from Hiking For Her's extensive website pages. But here's what makes the book special. Additional information and recommendations are included at the end of each chapter. Each chapter ends with a summary and "take away" section to streamline your reading time. 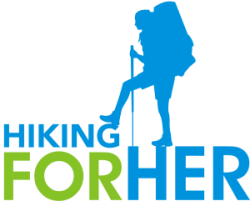 All of the tips have been enhanced and clarified to make it easy for you to learn and explore information that will make your hikes satisfying and safe. Some of the bonus material in this book will never be found on this website. Brand new and exclusive hiking information! If you've been reading this website for a while, you know that there will be a few surprises, too. I never pass up a chance to give you a little something extra to make your hiking day. The reviews of this dayhiking tips book on my Amazon author page will let you evaluate whether or not this book hits the mark for hikers. Or take a peek right here. "This book is absolutely packed with information. As an experienced hiker myself, I wasn't sure this book would be for me but WOW was I wrong. Diane has tips in here that I had never even thought of, especially the sections on what to eat and how to choose great footwear." "I currently receive your fabulous newsletter. I LOVE your new book and so appreciate your time and the good sharing of your hiking tips. Thank you and congrats on the launch of your book! PS: Your website is awesome!" "I think the information content and amount, presented in Diane's friendly, informal and readable way is worthy of this collection of advice, tips and tricks from personal experience and, importantly, interactions with the experiences of and questions from her web page readers." A paperback version allows you to highlight, bend down the pages, and make this book your personal mentor as you gain hiking skills! Putting yourself “out there” on a hiking trail is an expression of your adventurous spirit. planning your destination - and more. Having firm control over these variables puts you in a position of strength to deal with unpredictable events like nasty weather, animal encounters, and misadventures in map reading. It also makes your day hike much more enjoyable. If you're just starting out as a hiker, you will save yourself a ton of time and money by reading and applying these hiking tips. Use a “learn as you go” approach, with this book as your mentor. Been day hiking for a while but have a few gear, navigation, or food issues that you'd like to solve or improve? Use this book as a rich resource to fine tune your approach to the trail. Need a gift for the hiker(s) in the family? Want to be known as the best gift giver ever? Load this e-book onto a Kindle and wrap it up as a big surprise for your favorite hiker. It is my sincere wish that you will benefit from my labor of love to collect decades of dayhiking experience into one book. Why make rookie mistakes, when you can avoid them? Why struggle with how, and where, to buy the best hiking gear? Why agonize over how to hike, when this book will show you exactly what to do before, during and after your hike? Can you see that I really mean it when I say that HFH gives you hiking advice you can trust? to shorten your learning curve so you can savor trail time, enjoying each moment of your hikes. A dayhiking tips book for women was such a joy to write! But I don't have a Kindle! Amazon has already thought about this problem, and solved it with a free app that allows you to read my book on devices you already own: your computer, phone and tablet. Here's how to get the app installed so you can start reading the best dayhiking tips immediately. Or you can click the box that says "Read on any device" beneath the cover photo on this Amazon page. Using that link you can also "peek inside" to get an idea of what the book covers. Coming soon: More places to find my book, including Barnes and Noble (NOOK devices). I'll update this page once availability is confirmed. Or pick up the paperback version of these dayhiking tips, and savor the feel of a "real" book in your hands. Perfect for taking notes, bookmarking with sticky notes, and highlighting, too. "I have been reading your Hiking For Her book and it's SO good I haven't been able to put it down. As a beginning hiker it is ALL so relevant. Thank you for putting such a valuable resource together for us newbies." The hiking tips in Hiking For Her's dayhiking tips book can be blamed on my addiction to hiking. My obsession with hiking began innocently enough, with an invitation to join a Girl Scout backpacking trip to Isle Royale National Park in Lake Superior. Let's leave the date a bit vague, but call it 1970-ish. Give a girl a backpack, and she's gonna want boots. Give her sturdy boots, and she's gonna want a compass. Five decades later, I'm still hiking, but now I'm writing down my best hiking tips for hikers. What a rewarding way to reach out to my virtual hiking partners, via this Hiking For Her website. Every email I receive leads me down another path, literally or figuratively, and more pages of hiking tips get written as a result. Over the years, these hiking tips have really piled up (over 350 pages and growing). It's getting to be a challenge to find exactly what you need in the maze of interconnected hiking tips. The search box highlighted in green at the bottom of each page on the website helps you navigate. So does selecting “site map” on the navigation bar on each web page (see it up there on your left?). But I'm guessing that you want something a little faster when you have questions about day hiking. 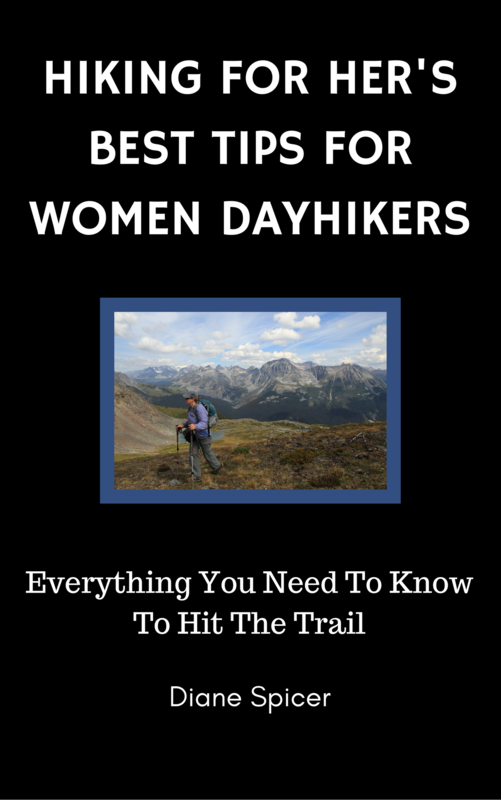 Let me know if you have any questions about my dayhiking tips book entitled Best Tips For Women Dayhikers. This book for women hikers was written with love and enthusiasm, because I know that's how you tackle the trail, too. And I'd be delighted to answer your questions, about the book or about hiking in general. Thanks for the chance to walk with you down the trail, if only for a little virtual while.